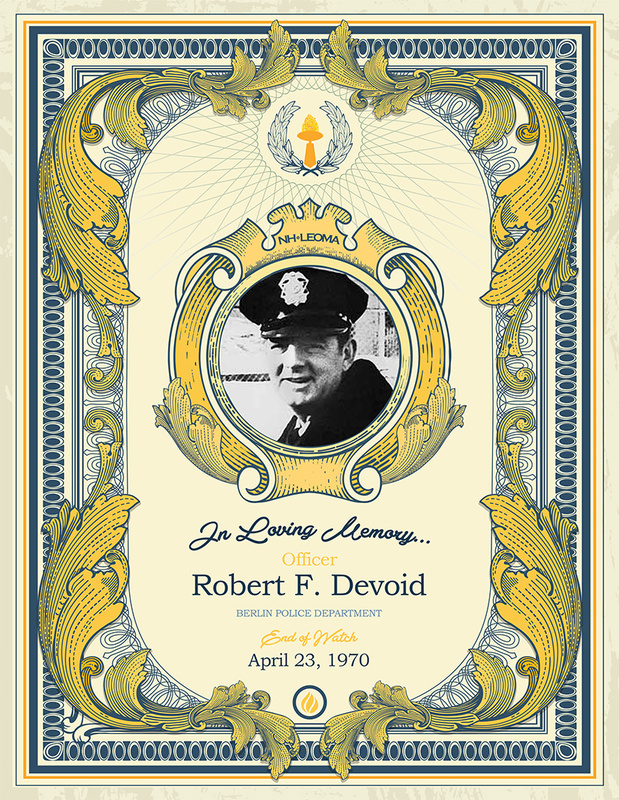 Officer Devoid was born on September 13, 1933, in Berlin, New Hampshire and was a lifelong resident. He graduated from Berlin High School, Class of 1951. He was a veteran of the Korean War, a member of the American Legion and the Fraternal Order of the Eagles Club. He was also a member of the New Hampshire Police Association and the Coos County Law Enforcement Association. He had been with the Berlin Police Department for two and one-half years. On the evening of April 23, 1970, Officer Devoid, along with Officer Dorman Wheelock, was traveling on Route 2 in Randolph. The two Berlin officers were on their way to Lancaster to pick up blood needed for a transfusion for Berlin Reporter Publisher Stevenson Munro who had been critically injured the week before. While Officer Wheelock was driving, the officers’ cruiser collided head-on with a vehicle carrying four teenagers. Both officers died in the collision, as did three of the teenagers in the other vehicle. Officer Devoid was 36 years old. He was survived by his wife, Jean, his two sons, Edward and Robert, and one daughter, Donna.